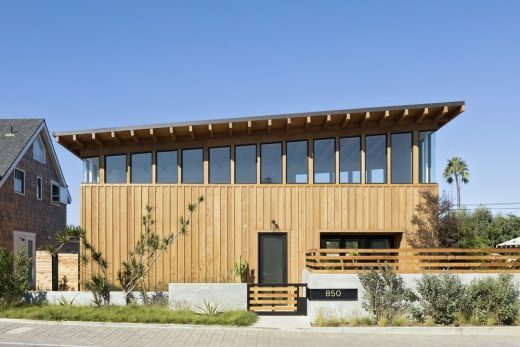 We’ve selected what we feel are the key examples of Californian Architecture. We cover major, completed Californian buildings and building designs. 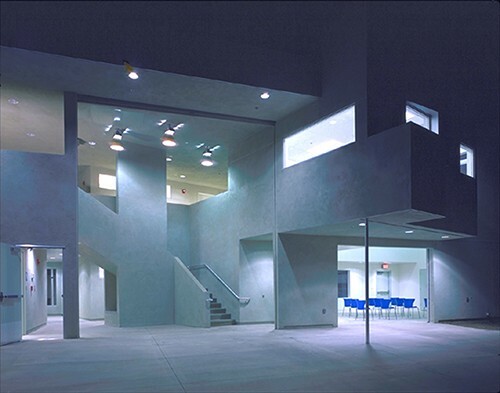 The focus is on contemporary Californian buildings. We have 4 pages of California Architecture selections. Celebrated Bay area buildings include the Contemporary Jewish Museum, the V. C. Morris Gift Shop, the de Young Museum, San Francisco Museum of Modern Art and the Federal building. Design: Brett Farrow Architect, Inc.
A new residential project located in the Southern California Coastal community of Encinitas, San Diego County. The small two-bedroom home makes full use of the site’s panoramic ocean views from its hilltop location on a small and irregularly shaped lot. The Golden State Warriors released the updated design of their new sports and entertainment arena on the waterfront at Piers 30-32 in San Francisco. This is not just a major new sports building but a significant piece of civic architecture and public realm. Cities across the North America – from Baltimore to Vancouver – have tried to reinvigorate their waterfronts and this development might go a long way in underlining San Francisco’s committment to quality cityscape. A partially-submerged lower level was designed with a pulled-back floor plate to create a light-filled atrium. In conjunction with the mechanical engineer, Klopf designed a net-zero energy home featuring insulated concrete forms, structural insulated panels, high-performance windows, cementitious siding and a solar photovoltaic system sized to cover all the energy usage. This new building has started on site, part of the Stanford University Medical Center: Project Renewal. The project is scheduled for completion in 2017. This is the design for the new Jan Shrem and Maria Manetti Shrem Museum of Art at the University of California, Davis. The Facebook Campus Project includes two project sites inclusive of the East Campus and West Campus. The Project is being processed in phases. The East Campus is located at 1 Hacker Way and was previously occupied by Oracle. The site is currently developed with nine buildings, which contain approximately 1,035,840 sqft. The approximately 22-acre West Campus is located at the intersection of Willow Road and Bayfront Expressway. Ben van Berkel of UNStudio and EE&K a Perkins Eastman company, and Jacobs Engineering propose a masterplan for this important city development. A weekend desert residence for a family and their dog, this contemporary California home is an exercise in site-specific experiential design. This 3,000 sqft three story residence is designed to maximise its oceanfront setting on only 2,625 sqft of beach property. This residence is set on a 55-acre property in the hills of Malibu with panoramic views. This is a 392-MW solar thermal power facility located in the Mojave Desert, California. Ivanpah is using mirrors to focus the power of the sun on solar receivers at the top of three 225m power towers. Located east of Joshua Tree in Wonder Valley this design is a ‘synthetic earthwork’ that doubles as a recreational amenity. This monumental basin stands 30 feet from rim to low point. Rock climbing holds mounted on the interior allow visitors to descend into a deep pool of water.